The arterial geometry used here (see Fig. 1) is a close approximation to the computed tomography (CT) model of a single-artery segment of the middle cerebral artery of a 57 year-old male with aneurysm. The arterial wall (i.e. the structural mechanics part of the problem) is modeled with the membrane element. The computations highlighted here are some of the earliest cardiovascular FSI computations carried out by the T*AFSM. The numerical methods used in these computations were introduced and implemented on parallel computing platforms by the T*AFSM. The set of numerical methods introduced by the T*AFSM over the years and used in these computations includes the DSD/SST formulation [1-4], the quasi-direct FSI method [5, 6], the stabilized space-time FSI (SSTFSI) technique , and special techniques for arterial FSI computations . 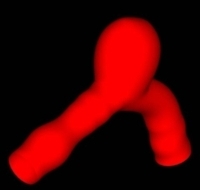 The CT model of the artery approximated in these computations was reported in . The inflow velocity used in the computations during the cardiac cycle is a close approximation to the one reported in , and is shown below. 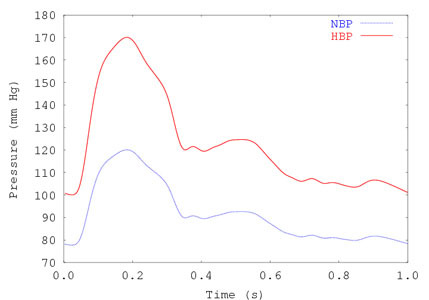 We consider normal and high blood pressure profiles (NBP and HBP), which are also shown below, in combination with uniform and variable wall thicknesses (UWT and VWT). 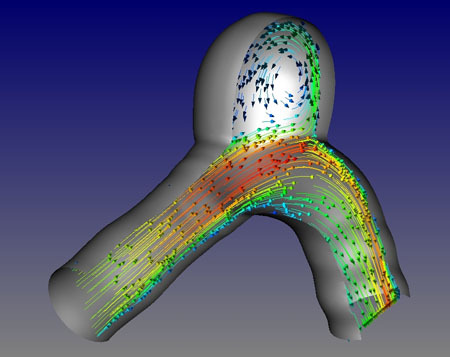 In VWT, the wall thickness for the aneurysm is 1/3 of the wall thickness for the rest of the artery segment. The computations were carried out on the ADA system at Rice University. For more details on these computations, see . Fig. 3. Blood-flow patterns at an instant during the cardiac cycle, obtained from the NBP-UWT computation. For details, see . Fig. 4. Blood-flow patterns at an instant during the cardiac cycle, obtained from the NBP-UWT computation. For details, see . Fig. 5. 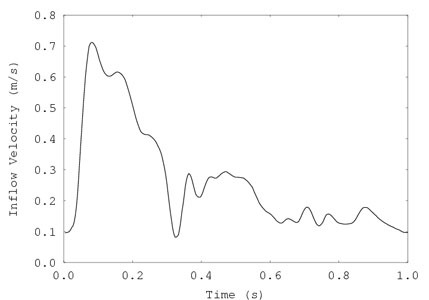 Arterial shape at three different instants during the cardiac cycle, obtained from the NBP-UWT computation. For details, see . Fig. 6. Deformation of the aneurysm for all four cases. The order of the cases from minimum to maximum deformation is NBP-UWT, HBP-UWT, NBP-VWT and HBP-VWT. For details, see . 9. R. Torii, M. Oshima, T. Kobayashi, K. Takagi and T.E. 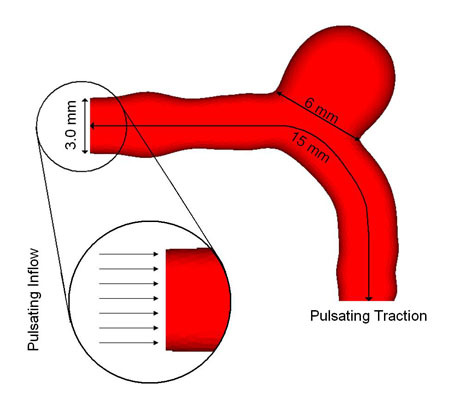 Tezduyar, "Influence of Wall Elasticity in Patient-Specific Hemodynamic Simulations", Computers & Fluids, 36 (2007) 160-168. 10. R. Torii, M. Oshima, T. Kobayashi, K. Takagi and T.E. Tezduyar, "Computer Modeling of Cardiovascular Fluid-Structure Interactions with the Deforming-Spatial-Domain/Stabilized Space-Time Formulation", Computer Methods in Applied Mechanics and Engineering, 195 (2006) 1885-1895.